Welcome to the Burgettstown Website! THE BURGETTSTOWN BOROUGH IS LOOKING FOR SOMEONE TO JOIN THE ZONING HEARING BOARD. Please call borough office for more information. MARCH 20 AND 25, 2019 FROM 6 AM TO 6 PM THE BURGETTSTOWN BOROUGH WILL BEGIN SWEEPING STREETS. IF YOUR STREET NEEDS VEHICLES REMOVED PLEASE LOOK FOR THE DESIGNATED SIGNS POSTED. THANK YOU! Please click the links below to download forms. 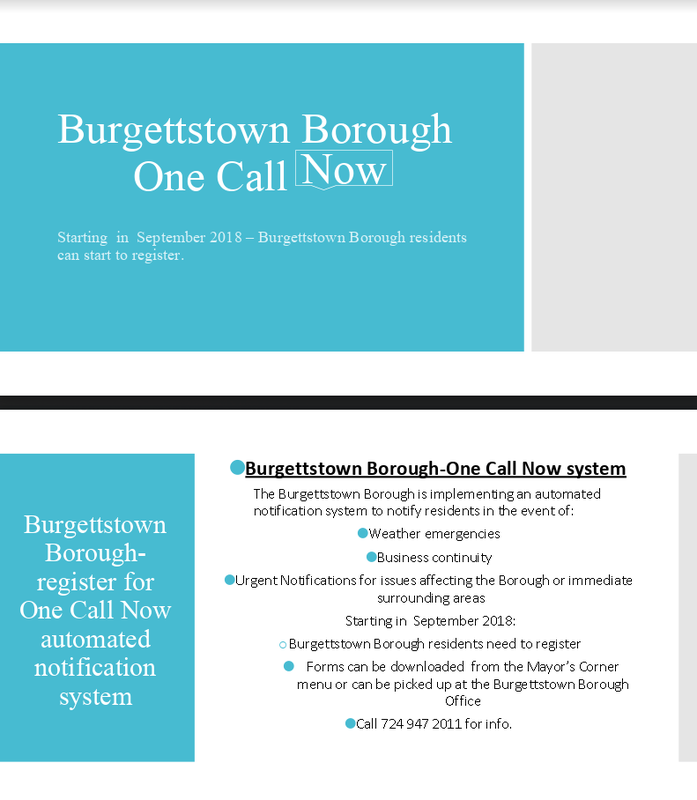 *The information on this site is for the benefit of all persons living in or interested in locating to Burgettstown Borough. Check out the Burgettstown Area School District website here for information.